Once there was a hammerhead that wasn't any good at carpentry. As hard as the shark tried, the fins just couldn't hold nails in place to hammer. So the sea creature decided to change its career path. That now the hammerhead is a professional break-dancer. Using its tail to pop-and-lock in underwater music videos. The sea is full of life and has a rhythm like no other. As the other fish are graceful ballerinas flowing through masses of kelp the shark steals the show. It's powerful head sways to the hip-hop beats the fins mimic a robot. The hammerhead is a shark that everyone knows because of it's distinctive head, but no one knows that they are groovy artist. Truly the best dancer under the sea. Or, maybe we just made all that up! You can be just like the hip-hop hammerhead with this costume. Boogieing down to sweet sea side beats in the Hammerhead Shark Costume. This can be worn over your normal clothing. Flash your smile from inside the sharks gaping jaws. 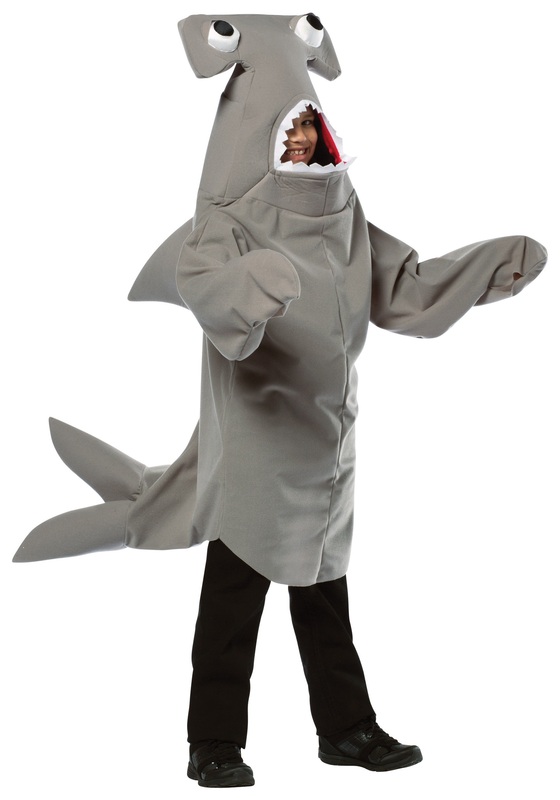 Before wearing this costume it is important to stuff the hammer head, tail, and fins with tissue paper for the full look. Once that is done all you have to do is pull the costume on and dance the night away. The fins, tail, and head are all sewn on so they won't fall off during pop-and-locking. Follow your dream like the hammerhead and dance like no one is watching.